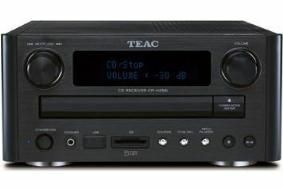 TEAC adds cost-effective micro receiver with iPod dock option | What Hi-Fi? The £250 CR-H258i can play CD, CD-R/RW and MP3 files from disc, music files from SD memory cards or USB storage devices, or tracks from an iPod using the company's DS-20 dock, available as a £40 option. It has 2x25W output power, and also offers two analogue audio inputs, digital and analogue audio outs, a subwoofer output and a headphone socket. The remote control supplied will also handle iPod functions, and the system has timer on and sleep functions. The CR-H258i is available now in black.